Those who follow Just Wandering on Facebook and Twitter would already know that I spent the weekend in Bangkok. If you recall, I was in Bangkok around the same time last year as well. The reason for heading to BKK last weekend was the same as last year’s: to stalk watch Rafael Nadal at the Thailand Open. Unfortunately, similar to last year, we weren’t able to watch Rafa play tennis in Bangkok. Last year, Nadal had to pull out of the competition because of his injury. Things are turning out much better this year: he’s in top form, winning the French Open, Wimbledon and US Open. Rafa was already in Thailand when we arrived last Friday night, but he was still vacationing in Hua Hin, a popular weekend haven for Thais just 5 hour’s drive from Bangkok. According to reports from the Thai newspapers, Rafa won’t be playing until September 30, when Prime Minister Abhisit Vejjajiva will formally open the tournament. Nadal or no Nadal, Cla and I headed to the Impact Arena. The Qualifier round has started, and we were just in time to watch her favorite Tennis Twitterer, Dmitry Tursunov playing against Marinko Matosevic. While Cla is a huge tennis fan, I’m just in it for the Fedal. Still, it was a pretty interesting experience feeling the buzz and excitement of the people walking around the grounds making their way to the arena to watch the players or milling around hoping to catch a glimpse of their tennis idols. We bought tickets to watch the game, THB 300 for the highest balcony. Whenever I chance upon tennis tournaments on TV, I always wonder if the people sitting at the very top of the bleachers are still able to see the players. I was surprised when we went inside that the arena isn’t all that big, even with two tennis courts. While the view from Section G wasn’t the best, Dmitry and Marinko weren’t tiny specks running to and fro either. Since it was just the Qualifier, the arena was practically empty. I’m guessing that as the Main Draw start, people will start trickling in, specially if it’s Rafa playing. How can you not buy that shirt? Dmitry won after two tie breaks, and as the two tennis players walk off the court, Cla and I were out of our seats and went back to exploring the grounds. As expected, there’s a number of booths selling tennis and other sports apparel and equipment. What caught our attention though was this booth selling souvenir t-shirts. White shirts with a very simple “I Nadal” was all it took to get us pulling out our wallets and handing over hard earned cash. Outside the arena, Cla and I (and Prez David) had a blast taking pictures with the player’s standees. We know it’s absolutely silly, posing with cardboard cut outs, but that made it so much more fun than it should be. As soon as we stopped snapping pictures, a teenage girl took her place beside cardboard Rafa to have her picture taken. While it seemed like this was another failed attempt at watching Rafael Nadal play in the Thailand Open, the trip was still one of the most fun I’ve taken in 2010. In every failure lies a lesson to be learned. We learned that it’d be better if we arrive on Thursday and catch the games on Friday or Saturday for the Main Draw, Quarter Finals and Semi Finals. 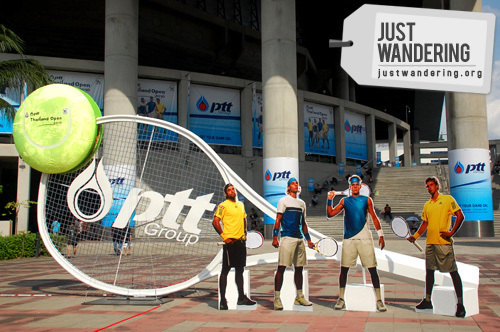 Next year, we’ll perfect you, Thailand Open 2011. Going to Bangkok this week and interested to watch the Thailand Open? Daily game schedule are posted on the PTT Thailand open website, while tickets can be bought online at Thai Ticket Major. You can also buy tickets on site. Watch out for scalpers though! 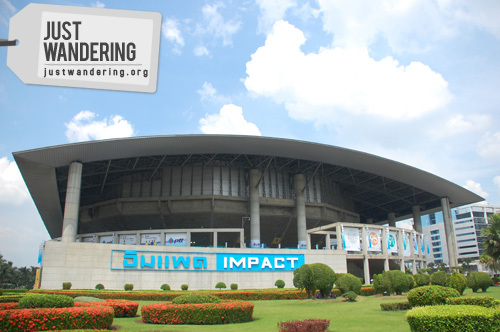 The Impact Arena is located in the Nonthaburi province of Thailand. The easiest way to get there is to ride the BTS Skytrain to Mo Chit station then ride the Impact Link shuttle. From the BTS, go down Exit 4. When you reach street level, make a U-turn and continue walking until you pass a gate that leads to a huge parking lot. Look for the Impact Link stop (I think it’s Number 1 — best to ask around as all the signs are in Thai). There’s a shuttle every 30 minutes. The drive to Impact takes approximately 30 minutes and costs THB 30 each. You will be dropped off in front of Impact Challenger. Just cross the street to the Impact Exhibition Hall then walk to the right to get to the Impact Arena. Love Nadal? 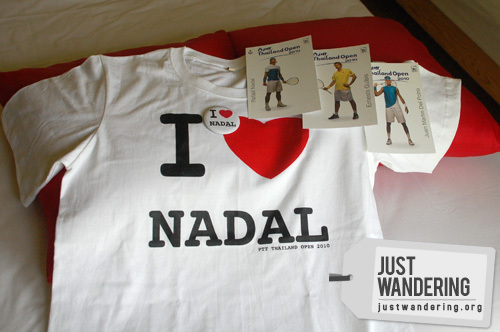 Get a chance to win this I Nadal shirt! It comes with a matching pin and Thailand Open 2010 postcards featuring Rafael Nadal, Juan Martin del Potro and Ernests Gulbis. All you need to do is post a comment with your answer to this question: Who is your favorite tennis player of all time? Contest will run from September 28 – October 3, 2010. Winner will be picked through a random drawing through Random.org’s Randomizer. This contest is open to Philippine residents only. di ko naisip na babalik ka ng BKK for the Nth time para manood ng tennis competition. i thought food tripping lang and shopping, as always. i have to have that shirt! i love it! I see Fake!Nadal. Knowing you two, not seeing the real one didn’t dampen your spirits hehe. Where did you stay this time? I don’t watch tennis often but Nadal is just *drool*! I want that shirt! Omg nina, you were in BKK around the time I was there too. But I didn’t know about the Thailand open until I read a couchsurfing post about it and it was too late. I would have loved to see Rafa. Saw him at the US Open in 2008. Of course he’s my favorite! Even with his wedgie moves! I just started watching tennis 2 years back when I saw Federer and Nadal battle it out in the Australian Open. I prefer Federer! Without a doubt, it has to be RAFAEL NADAL! Why wouldn’t I? He’s the one of the youngest to win a career grand slam, he’s one of the two left-handers to win the grand slam, and he also won an Olympic gold! Oh yeah, he’s definitely a hottie! my fave tennis player — andre agassi! he was the only tennis player i knew of when i was younger =p i think he was the one who brought the sport of tennis to my attention!